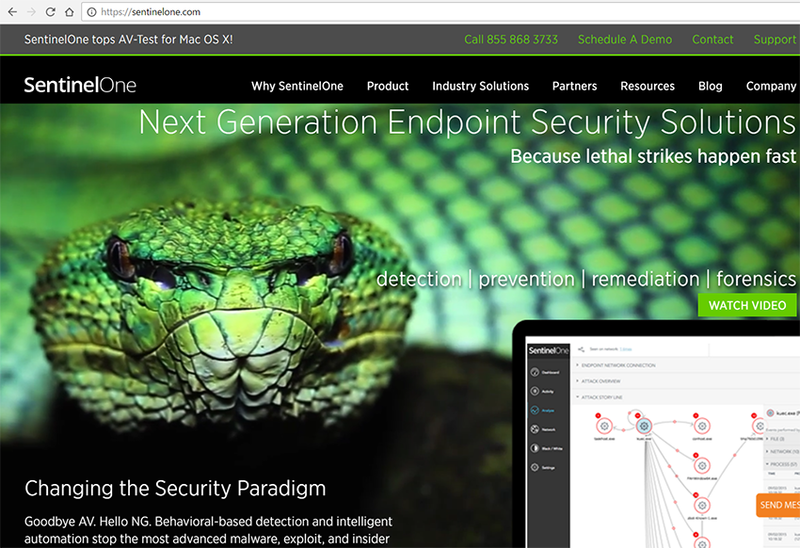 SentinelOne, a start-up based in Palo Alto, California, raised an additional $70 million in Series C financing for its next generation endpoint security powered by machine learning and dynamic behavior analysis. 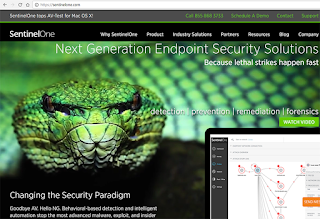 SentinelOne unifies endpoint threat prevention, detection and response in a single platform driven by sophisticated machine learning and intelligent automation. SentinelOne said its solution enables organizations to detect malicious behavior across multiple vectors, to rapidly eliminate threats with fully-automated, and to adapt their defenses against the most advanced cyber attacks. Redpoint Ventures led the round along with new investment from Ashton Kutcher and Guy Oseary’s firm, Sound Ventures. Existing investors Third Point Ventures, Data Collective, Granite Hill Capital Partners, Westly Group, and SineWave Ventures also participated in the round, bringing the total investment in SentinelOne to more than $110 million to date. AT&T posted Q4 consolidated revenues of $41.8 billion, down from $42.1 billion in the year-ago quarter. Compared with results for the fourth quarter of 2015, operating expenses were $37.6 billion versus $34.6 billion; operating income was $4.2 billion versus $7.5 billion; and operating income margin was 10.2% versus 17.9%. Fourth-quarter net income attributable to AT&T totaled $2.4 billion, or $0.39 per diluted share, compared to $4.0 billion, or $0.65 per diluted share, in the year-ago quarter. Cash from operating activities was $10.1 billion in the fourth quarter, and capital expenditures were $6.5 billion. “2016 was a transformational year for AT&T, one in which we made tremendous progress toward our goal of becoming the global leader in telecom, media and technology,” said Randall Stephenson, AT&T Chairman and CEO. “We launched DIRECTV NOW, our innovative over-the-top streaming service. Our 5G evolution plans and improved spectrum position are paving the way for the next-generation of super-fast mobile and fixed networks. 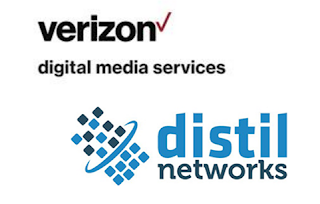 And we shook-up the industry with our landscape-changing deal to acquire Time Warner, the logical next step in our strategy to bring together world-class content with best-in-class distribution which will drive innovation and more choice for consumers." F5 Networks reported Q1 revenue of $516.0 million, up 5.4 percent from $489.5 million in the first quarter of fiscal 2016. GAAP net income was $94.2 million ($1.44 per diluted share), compared to $89.7 million ($1.28 per diluted share) in the first quarter a year ago. Excluding the impact of stock-based compensation and amortization of purchased intangible assets, non-GAAP net income was $130.3 million ($1.98 per diluted share), compared to $120.6 million ($1.73 per diluted share) in the first quarter of last year. “As we anticipated, the launch of BIG-IP iSeries, which we successfully completed in November, was a significant contributor to product revenue which grew 2 percent year-over-year,” said John McAdam, F5 president and chief executive officer. “iSeries bookings during the quarter represented approximately 18 percent of appliance bookings and we believe that percentage will increase during the current quarter with general availability of the complete family for the entire quarter. Global Capacity announced its nationwide Ethernet service expansion with a network investment in 346 central offices. Global Capacity said its investment in central office facility equipment enables it to leverage the existing copper infrastructure to deliver from 1 Mbps up to 100 Mbps access directly to customers, satisfying the growing demand for hybrid and SD-WAN network solutions. 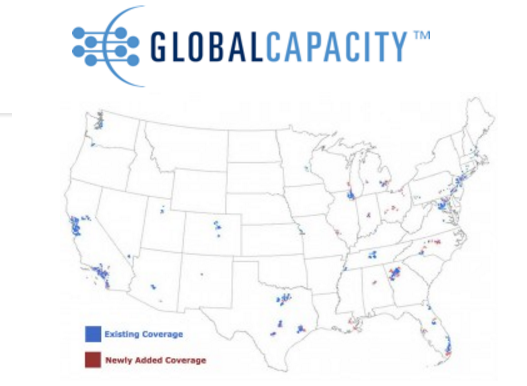 "As demand for our Ethernet offerings continues to soar, Global Capacity recognizes the need to respond quickly to businesses to provide scalable solutions that can meet demand as they grow," comments Jack Lodge, President, Global Capacity. "Global Capacity will continue to expand Ethernet coverage in 2017 to address the need to connect to high-value destinations, including private and public Cloud, business applications, internet and data centers." 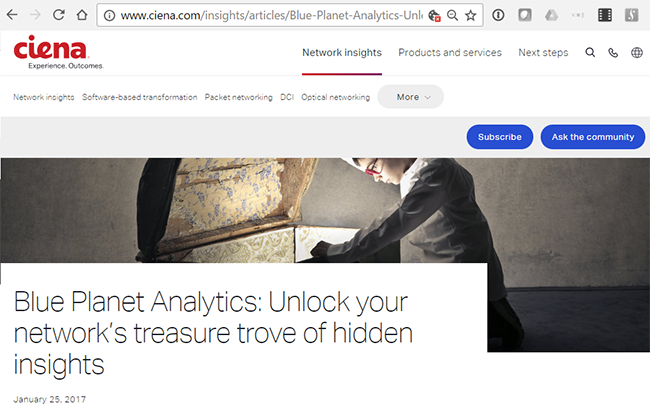 Ciena is integrating analytics and machine learning into its Blue Planet portfolio to help service providers improve the end user experience and simplify network operations. Specifically, Blue Planet Analytics combines analytics with orchestration and policy. It utilizes machine learning on data collected from multiple sources, including multiple network vendors, layers and physical or virtual domains. It can also take advantage of third party big data cluster systems such as Hadoop, Cloudera, and Hortonworks. Ciena said the new capability and related applications gives operators the ability to visualize and identify trends in order to create more profitable services, better predict capacity requirements, and anticipate potential network and service disruptions before they take place. “We’ve long anticipated how today’s emerging trends like 5G, IoT and virtualization would fundamentally change networks and drive new business models. A natural extension of our Blue Planet software suite, our new Analytics capability and NHP application give operators a powerful mechanism to improve network performance and speed our customer’s transition to a more intelligent, automated, and profitable network,” stated Nirav Modi, Vice President and General Manager, Blue Planet, Ciena. China is likely to become the world's largest data centre market. 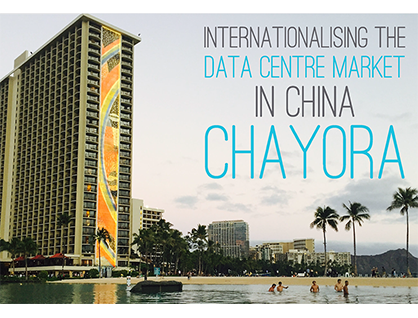 Chayora is a world-class infrastructure developer based in Hong Kong with a primary focus on building data centre platforms in China. In this video, Chris Miller, Global Client Director at Chayora, discusses the company's operational strengths and prospects for growth in China. Filmed at PTC'17 in Honolulu, Hawaii. Apstra, a start-up based in Menlo Park, California, released its Apstra Operating System (AOS) 1.1.1 and an integration with Wedge 100, Facebook’s second generation top-of-rack network switch. 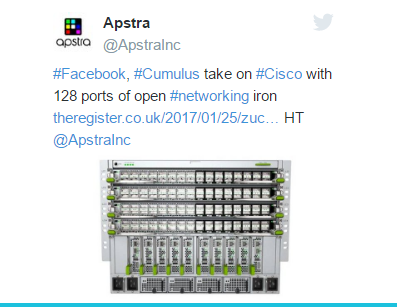 Apstra said its distributed operating system for the data center network will disaggregate the operational plane from the underlying device operating systems and hardware. Sitting above both open and traditional vendor hardware, AOS provides the abstraction required to automatically translate a data center network architect’s intent into a closed loop, continuously validated infrastructure. The intent, network configurations, and telemetry are stored in a distributed, system-wide state repository. Facebook unveiled Backpack, its second-generation modular switch platform developed in house at Facebook for 100G data center infrastructure. It leverages Facebook's recently announced Wedge switch. Backpack is designed with a clear separation of the data, control, and management planes. It uses simple building blocks called switch elements. The Backpack chassis is equivalent to a set of 12 Wedge 100 switches connected together. The orthogonal direct chassis architecture opens up more air channel space for a better thermal performance for managing the heat from 100G ASICs and optics. Facebook will use the BGP routing protocol for the distribution of routes between the different line cards in the chassis. The design has already entered production and deployment in Facebook data centers. The company plans to submit the design to the Open Compute Project.